This afternoon I attended the latest meeting of the Dundee West Transition Town group. This is a very interesting group which is trying to deal with many of the key issues which the world faces today in a practical manner. There was a very interesting discussion about ways in which we can promote food production in our urban setting in the West End. I am developing a some information about alternative forms of finance which I hope will be of use to this group. I joined trade unionists in Dundee in taking part in a demonstration today in Dundee in support of the European TUC campaign 'No to austerity'. The TUC supported this campaign. My trade union the GMB supported the event today and I was pleased to join many other GMB members in the protest. While the ConDem government may well be promoting austerity the Labour Group on the City Council will be doing all we can to protect jobs and services in Dundee. There are difficult days ahead but we must be clear that some bad decisions are coming. But we should not make a bad situation worse. Fairness should be our watchword in these discussions. Cuts should not disproportionately target the poor, either in terms of jobs or service provision. This evening I was really pleased to attend a meeting of parents at Blackness Primary School interested in forming a Walking Bus. A walking bus is a means of children walking safely to school in the morning. The concept is explained in some detail here. I think that this is a good idea and that it can improve safety around the school. It will also make a contribution to improving the environment. I hope that the parents at the school get enough volunteers and make a success of this project. I have asked that the council Education Department supports setting up the walking bus. This afternoon I had a very productive meeting with Dr Jim McGeorge the Secretary of the University of Dundee. As a councillor in the West End I find it useful to have a regular meeting with the University to discuss their work and its impact on the West End. It is important to people in the West End and to the university that the University acts as a good neighbour. At lunchtime I was at a preview of the exhibition of the six shortlisted designs for the V & A at Dundee. The pictures here are thumbnails of the shortlisted designs. To find out more please visit the V & A at Dundee website. STV carried a report about the exhibition which can be viewed here. The exhibition opens at the University of Abertay Dundee's Library from 29 September until 4 November details of the opening hours are on the V & A at Dundee website. The exhibition is stunning and well worth a visit and there are opportunities to make your views known about the designs. These are exciting times for the city and I hope that this project comes to fruition sooner rather than later. It is great to see a great British institution keen play a role in the regeneration of our great city. I was very saddened to hear of the untimely death of my friend and comrade Peter Court. Peter was a member of the Dundee District Council for ten years and served as City Treasurer. After his time on the council he was the Chair of Dundee Labour Party for many years. Peter worked for many years at the Michelin factory and was an activist in AUEW, AEEU, Amicus and finally Unite. Peter was also for many years on various committees at the University of Abertay Dundee and was awarded an Honorary Fellowship as a result of his work for the University. The picture shows Peter when he was awarded the fellowship. 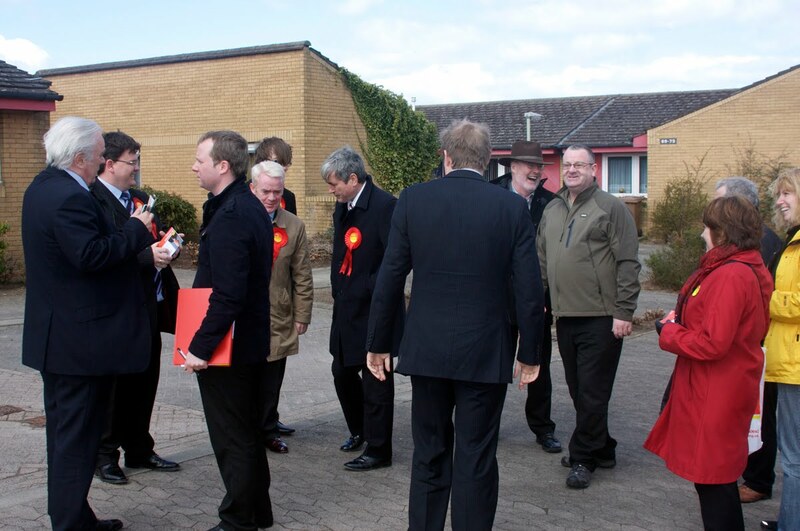 The other picture shows Peter and a group of us out campaigning for Jim McGovern earlier this year, as ever with Peter there was always a good laugh (Peter has the hat on). Peter will be sorely missed by his many friends and most especially by his wife Sandra and his daughter Shonagh. I was pleased that the SNP Administration leader Ken Guild paid tribute to Peter Court at the council meetings on Monday, this was a nice touch. The ongoing struggle to refurbish Harris Academy took a small step forward at the Education Committee on Monday evening. This report sets out the work that needs to be done to satisfy Historic Scotland before work can continue. I want to see Harris Academy refurbished as soon as possible. I want the work to go quicker than is suggested in the report but I understand that it requires to be done correctly. I would want an assurance that the planning work will be concluded as quickly as possible and that every effort is made to start and more importantly finish these works sooner rather than later. There was considerable disappointment when the delay was announced prior to the summer and I hope that everyone associated with Harris Academy will soon be able to see tangible progress. Along with my colleague Councillor Tom Ferguson, Labour's Spokesperson on City Development on Dundee City Council and I have called for a continuation of direct rail services between Dundee and London. This was debated by the City Council's City Development Committee (see pages 39-51) on Monday evening and I am pleased that this was passed unanimously. It is important that the council speaks with one voice when discussing matters which affect the future of our city, the Administration should bear this in mind. Most importantly we must all make our voices heard and as Monday's Courier said a solution must be found. I was saddened to learn of the death of well known West End resident Bert Norrie. Bert was a lovely man and a long-term member of the Labour Party. Bert was always looking to help out at election time and must have spent many hours standing at the Polling Station at St Peter's Free Church. My thoughts and prayers are with Bert's wife Cath and his family at this difficult time. I was delighted that Labour's leadership campaign finally came to end on Saturday. I was pleased that Ed Miliband won, I think that Ed will do a great job. You can read Ed's acceptance speech here, or view it here. 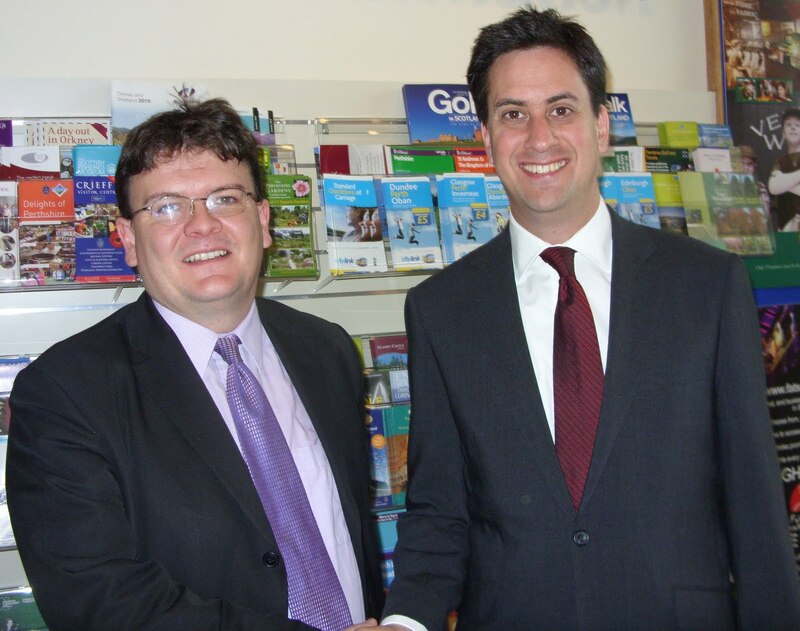 It was good to see Ed in Dundee a couple of weeks ago and I hope that he will return soon to campaign for Labour in the city. I am sure that over the next few weeks and months Ed Miliband will formulate a range of exciting policies which will challenge the ConDem in Westminster and the SNP in Holyrood. On Saturday morning I attended the Friends of Magdalen Green coffee morning which was held in Dundee West Church Hall. This was a good event where I met lots of people from the West End. I am glad to be able to support the Friends of Magdalen Green who take a great pride in our local area. Well done to them all. As Labour spokesperson for Leisure, Arts and Communities on Dundee City Council I have congratulated everyone connected with the Bonnie Dundee campaign who have won awards at the Beautiful Scotland awards. I would like to congratulate the Bonnie Dundee campaign and the various council staff who have made the efforts which allowed Dundee to win a Silver medal. The City Council has once again won the Sustainable Development award showing that the city is at the forefront of the best environmental practice. Well done to Broughty Ferry for a Silver Gilt award and also to Ardler for a Bronze award. I was particularly pleased that the judges praised the McManus Galleries. It is important that the council remembers that the work which goes on to prepare for the Beautiful Scotland awards which includes both volunteers and council workers is important. It might seem easy to make cut backs to gardening in the city or to put less stress on environmental issues but cuts here would actually impact on the quality of life of the people of Dundee. We can all play a part in keeping our city 'bonnie' and the council should take a lead. One of the meanest and most mistaken cuts so far anticipated in Dundee has been set in train by the SNP led City Council. They have initiated a short term review of welfare rights services in the city as part of the measures they devised to identify savings to deal with the anticipated £20 million shortfall in the council's budget for the next financial year. At a point when many Dundee folk are exposed to the negative side effects of the bankers' excesses, why do our SNP Councillors think that there is any scope for significant savings to be made in welfare rights agencies in Dundee ? Recent news on the Dundee economy have made for grim reading. Rising levels of unemployment, combined with job losses at Realtime Worlds and low vacancy rates. And the prospects are not looking good with alarming levels of public sector cuts in the city amounting to 1000 jobs disappearing. Add to that the impact on low income households of proposed cuts in social security benefits announced by the Conservative/Liberal Democrat coalition. Already some agencies such as CAB in Dundee are reporting that demand for welfare benefits advice and debt counselling are stretching their resources. "As a council, I think its our civic duty to protect the citizens of Dundee when they experience reductions in household income. If we don't have a vibrant range of free and independent advice agencies in the city, we can't guarantee the rights of our citizens when they are experiencing financial hardship or treated unfairly by public bodies and private organisations. Without access to free and independent advice services, these rights would only be reserved for people who can afford to buy their own financial and legal advice from solicitors and accountants. It's also common sense that if you maximise a household's income by helping them claim the welfare benefits they are entitles to, it not only raises the household's income but also increases the money circulating in the local economy in Dundee. It's a 'no brainer' that the demand for debt counselling and welfare rights advice in our city is likely to escalate rather than reduce. Why are the SNP being so unsympathetic to our citizens at times in their lives when they are experiencing hardship?" As part of the wide ranging 'Changing for the Future' package of measures, approved at the Policy & Resources Committee of Dundee City Council on Monday 23rd August, there was a Review of Welfare Rights provision. Link to the Policy & Resources Committee Agenda and Papers which run to 204 pages. NB you will only need to examine/print out pages 7 - 16. The Review of Welfare Rights was one of the reasons why Labour Councillors voted against the 'Changing for the Future' agenda but the SNP group pushed ahead using their majority on the Council. There is a thirteen week time frame for the review concluding at the end of November 2010.